Those who travel to Egypt are often treated to a tour of the pyramids at Giza, bounced to Luxor for a morning at Karnak and an afternoon looking at the empty rooms that were King Tut's tomb, a relaxing Nile cruise up to Abu Simbel because everybody else does it, and a mystifying few hours running through the Cairo Museum with a guide who knows the names of everything, and little more. There is more, a lot more. The Egyptians had a far different world view from that of our time. There are scattered signposts that, taken together, point to a deep knowledge of the human experience. If you visit Egypt, pause a lot. Sit with a statue or a temple and connect with the power there. It is still there, if you listen. And that means it is right here where you are now as well. Don't let the guides, in Egypt or anywhere else, hurry you along. Most tours begin with the Giza Pyramids, but few point out that these giant structures - the largest ever built by man - were built at the earliest stage of Egyptian and thus human civilization. There is a gap, some important part of the story we do not know. 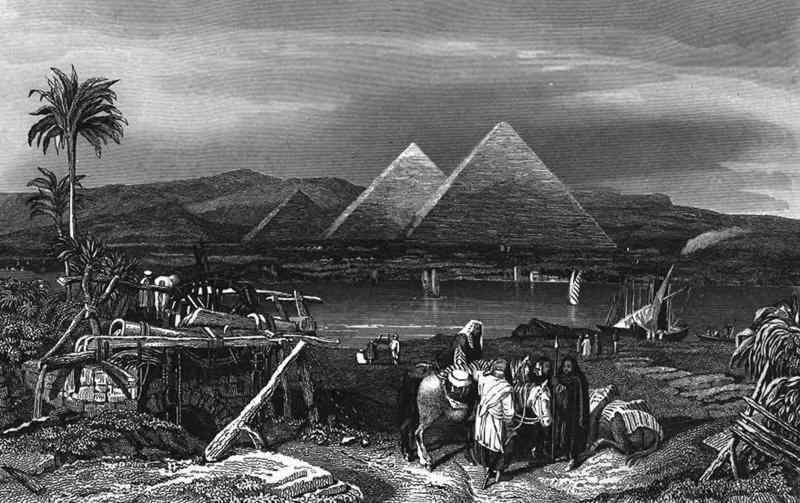 Giza is the burial ground of ancient Memphis, which was located a few miles south of modern Cairo. Memphis was sometimes the capital of Egypt, the Nile delta fans out just after the river passes there. The large area to the north was heavily populated, prone to flooding, and has had many yards (meters) of silt deposited over whatever ruins remain. Although half of ancient Egypt was north of Memphis, there is very little to see there. Another gap is the focus of this website on the higher sense of Egypt. 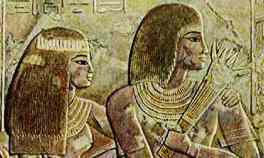 The Egyptian civilization treasured beauty and harmony, as much as any culture in history. Yet, the bulk of Egyptian religious practice was petty magic, and the temples often were more political and economic powers than spiritual. Still, there is something pure that rises to the top. Egypt is the home of Alchemy. From the tomb of Thutmose III, Thebes. 11th hour of the Amduat. 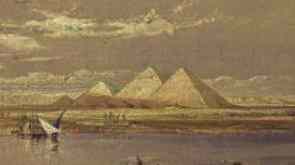 Here is the story of a journey to Giza written over a hundred years ago. Merely a day or two, for the Sphinx. A night wondrously clear and of a color unknown to our climate. A place of dreamlike aspect, fraught with mystery. The moon of a bright silver, which dazzles by its shining, illuminates a world which surely is no longer ours, for it resembles nothing that may be seen in other lands. A world in which everything is suffused with rosy color beneath the stars of midnight, and where stone symbols rise up, ghostlike and motionless. Postcard by Wolff Hagelberg 1901. Is that a hill of sand that rises over there? One can scarcely tell, for it has no shape, no outline, rather it seems like a great rosy cloud. Perhaps some huge, trembling billow once raised itself there, to become motionless for ever. . . . And out from this kind of mummified wave a colossal human effigy emerges, rose- colored too, a nameless, elusive rose. It emerges, and stares with fixed eyes and smiles. It is so huge it seems unreal, as if it were a reflection cast by some mirror hidden on the moon. . . .
And behind this monster face, far away in the rear, on the top of those undefined and gently undulating sandhills, three apocalyptic signs rise up against the sky. Those rose-colored triangles, regular as the figures of geometry, are so vast in the distance that they inspire you with fear. They seem to be luminous of themselves, so vividly do they stand out in their clear rose against the deep blue of the star-filled vault. And this apparent radiation from within, by its lack of likelihood, makes them seem more ominous. And all around is the desert, a corner of the mournful kingdom of sand. Nothing else is to be seen anywhere save those three awful things that stand there upright and still. The human likeness magnified beyond all measure, and the three geometric mountains, at first sight like exhalations. Visionary things, the features of the vast mute face, subtleties of shadow which show that it exists, rigid and immovable, fashioned out of imperishable stone. Even had we not known, we must soon have guessed, for these things are unique in the world. 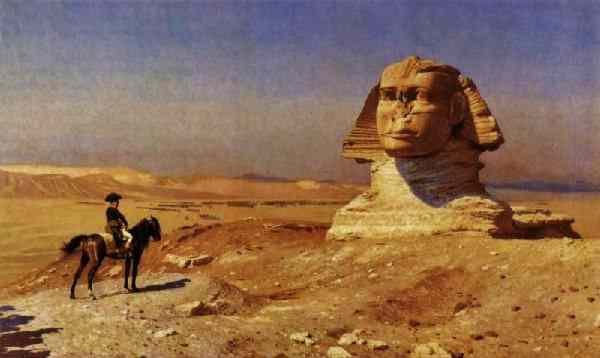 Pictures of every age have made the knowledge of them commonplace: the Sphinx and the Pyramids! But what is strange is that they should be so disquieting. . . . And this pervading color of rose, where comes it, seeing that usually the moon tints with blue the things it illuminates? One would not expect this color either, which, nevertheless, is that of all the sands and all the stones of Egypt and Arabia. And then too, the eyes of the statue, how often have we seen them? We did not know that they were capable only of their one fixed stare. Why is it then that their motionless regard surprises and chills us, even while we are obsessed by the smile of the sealed lips that seem to hold back the answer to the supreme enigma? . . . It is cold. A wintry mist rises low down in the little valleys of the sand. And that again we were not expecting. Beyond question the English, by changing the course of the Nile, to water the earth and make it more productive, have brought here the humidity of their own misty isle. And this strange cold, this mist, light as it still is, seems to give an added remoteness and finality to all this dead past, which lies here beneath us in subterranean labyrinths haunted by a thousand thousand mummies. And the mist, which, as the night advances, thickens in the valleys, hesitates to mount the great daunting face of the Sphinx. It covers with the merest and most transparent gauze. Like everything else here tonight, this gauze, too, is rose-colored. 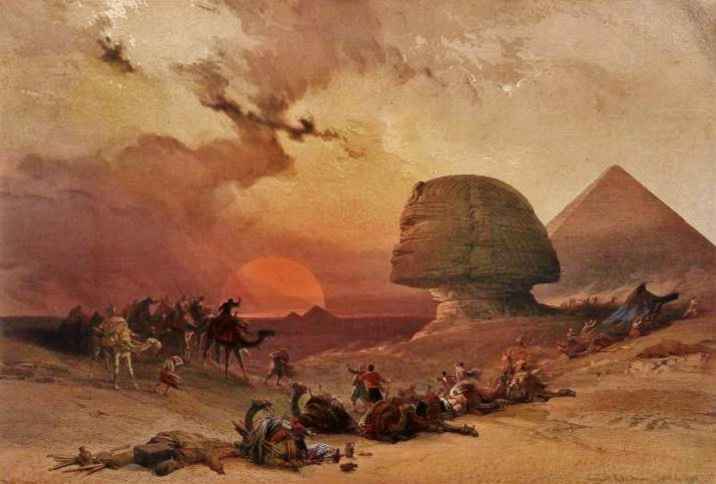 Meanwhile the Sphinx, which has seen the unrolling of all the history of the world, is plunged in profound and mystic contemplation of the moon, its friend for the last 5000 years, and notes impassively the change in Egypt's climate. Here and there on the soft pathway of the sandhills are tiny figures of men that move about or sit squatting as if on the watch. Small as they are, low down in the hollows and far away, this wonderful silver moon reveals even their slightest gestures. Their white robes and black cloaks stand sharply out against the monotony of the desert. At times they call to one another in a harsh, aspirate tongue, and then go off at a run, noiselessly, barefooted, with burnouses flying, like moths in the night. They lie in wait for the parties of tourists who arrive from time to time. These great symbols, during the hundreds and thousands of years that have elapsed since men ceased to venerate them, have nevertheless scarcely ever been alone, especially on nights with a full moon. Men of all races, of all times, have come to wander round them, vaguely attracted by their immensity and mystery. In the days of the Romans they had already become symbols of a lost significance, legacies of a fabulous antiquity. People came curiously to contemplate them, and tourists in toga and in peplus carved their names on the stone of their bases for the sake of remembrance. The tourists who have come tonight, and upon whom have pounced the black-cloaked Bedouin guides, wear cap and ulster or furred greatcoat. Their intrusion here seems almost an offence. But, alas, such visitors become more numerous each succeeding year. The town near by has become a place of rendezvous and holiday for the idlers and upstarts of the whole world. The modern spirit encompasses the old desert of the Sphinx on every side. It is true that up to the present no one has dared to profane it by building in the immediate neighborhood of the great statue. Its fixity and calm disdain still hold some sway, perhaps. But little more than a mile away there ends a road traveled by hackney carriages and tramway cars and noisy with the delectable hootings of stylish motor cars. Behind the pyramid of Cheops squats a vast hotel to which swarm men and women of fashion, the latter absurdly feathered. They are joined by ancient English ladies, a little the worse for wear, who bring their rheumatisms for the treatment of the dry winds. Passing on our way we had seen this hotel and these people in the glare of the electric lights, and from an orchestra that was playing we caught the trivial air of a popular refrain. Then, by a dip of the ground, all this had disappeared. What a sense of deliverance possessed us, how far away this turmoil seemed! As soon as we commenced to tread upon the sand of centuries, where our footsteps made no sound, nothing seemed to have existence, save only the great calm and the religious awe of this world into which we have come, of this world where all seemed silent, undefined, gigantic and suffused with rose-color. And first there is the Pyramid of Cheops, whose immutable base we had to skirt on our way hither. In the moonlight we could see the separate blocks, so enormous, so regular, so even in their layers. These stones lie one above the other to infinity, getting ever smaller and smaller, and mounting, mounting in diminishing perspective, until at last, high up, they form the apex of this giddy triangle. 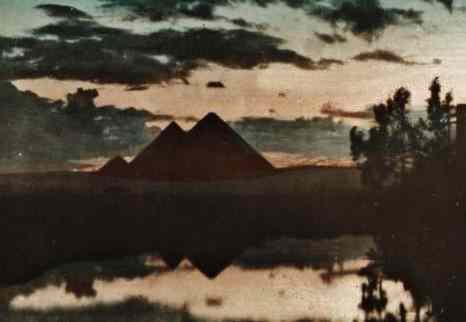 And the pyramid seemed to be illuminated by some sad dawn, a dawn which made ruddy only the sands and the stones of earth, and left the heavens, pricked with their myriad stars, more awful in their darkness. How impossible it is for us to conceive the mental attitude of that king who, during thirty-some years, spent the lives of thousands and thousands of his people in the construction of this tomb, in the fond and foolish hope of prolonging to infinity the existence of his mummy. There was still a short way to go before we confronted the Sphinx, in the middle of what our contemporaries have left him of his desert. The sandhill we descended looked like a cloud and seemed as if covered with felt, in order to preserve in such a place a more complete silence. Here and there we passed a gaping black hole--an airhole, as it seemed, of the profound and inextricable kingdom of mummies, very populous still, in spite of the zeal of the exhumers. 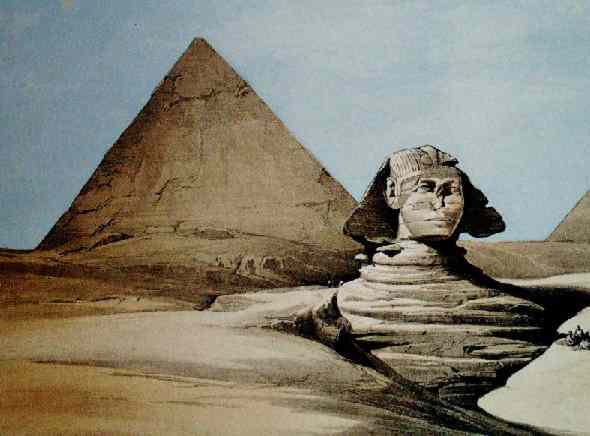 As we descended the sandy pathway we were not slow to perceive the Sphinx itself, half hill, half crouching beast. It had its back turned on us like a gigantic dog that thought to bay the moon. Its head stood out in dark silhouette, like a screen before the light it seemed to be regarding, and the lappets of its headgear showed like downhanging ears. Then gradually, as we walked on, we saw it in profile, shorn of its nose, but having already an expression disdainful, with thrust-out chin and baffling, mysterious smile. At length we arrived before the colossal visage, face to face with it. Its' gaze passed high above our heads. There came over us the sentiment of all the secret thought which these men of old contrived to incorporate and make eternal. But in full daylight their great Sphinx is no more. It is greatly scarred by time. But after the manner of all phantoms, it comes to life again at night, beneath the enchantments of the moon. For the men of its time whom did it represent? King Chephren? The Sun God? Who can rightly tell? 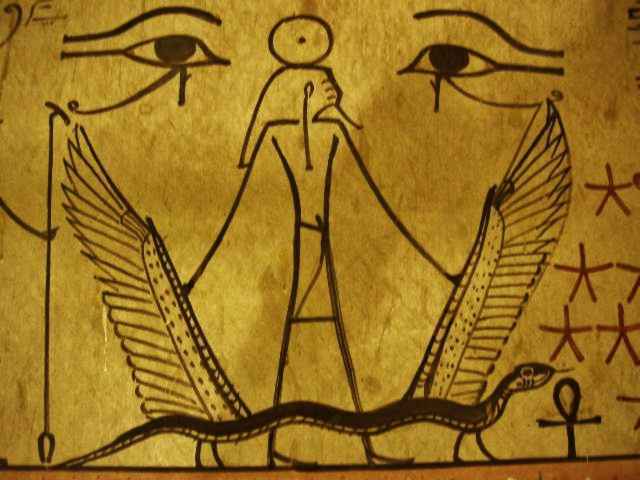 Of all Egyptian images it remains the least understood. The unfathomable thinkers of Egypt symbolised everything for the benefit of the uninitiated under the form of awe- inspiring figures of the gods. It may be, that, after having meditated so deeply in the shadow of their temples, and sought so long the everlasting wherefore of life and death, they wished simply to sum up in the smile of these closed lips the vanity of the most profound of our human speculations. . . . It is said that the Sphinx was once of striking beauty, when harmonious contour and coloring animated the face, and it was enthroned at its full height on a kind of esplanade paved with long slabs of stone. But was it then more sovereign than it is tonight in its last decrepitude? Almost buried beneath the sand of the Libyan desert, which now quite hides its base, it rises at this hour like a phantom, nothing solid sustains in the air. It is midnight. In little groups the tourists of the evening have disappeared to return perhaps to the neighboring hotel, where the orchestra doubtless has not ceased to rage. Some--the stouthearted ones--departed talking loudly and with cigar in mouth, others, however, lowered their voices as people instinctively do in church. And the Bedouin guides, who a moment ago seemed to flutter about the giant monument like so many black moths, they too have gone. The show for tonight is over, and everywhere silence reigns. The rosy tint fades on the Sphinx and the pyramids, all things in the ghostly scene grow visibly paler, for the moon as it rises becomes more silvery in the increasing chill of midnight. The winter mist, exhaled from the artificially watered fields below, continues to rise, takes heart and envelops the great mute face itself. 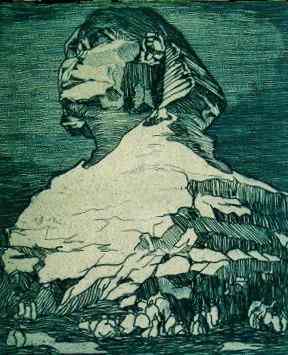 And the Sphinx persists in its regard of the lifeless moon, preserving still the old disconcerting smile. It becomes more and more difficult to believe that here before us is a real colossus. It seems to be a diluted reflection of a thing which exists elsewhere, in some other world. And behind in the distance are the three triangular mountains. The fog envelops them, too, till they also cease to exist, and become pure imagination. Now an intolerable sadness is expressed in those large eyes with their empty sockets. For, at this moment, the ultimate secret, that which the Sphinx seems to have known for so many centuries, is told: That all these dead men and women who sleep in the vast necropolis below have been fooled. The awakening signal has not sounded for a single one of them. That the creations of mankind--mankind that thinks and suffers on the earth--are destined to become empty dust. That mankind's truest aspirations are elsewhere. ... pen name of Louis Marie Julien Viaud (1850 - 1923). editions Rene Kieffer, Paris, 1924. Translated from the French by W. P. Baines. Etext prepared by Dagny and John Bickers. Adapted for AscendingPassage.com, 2006, 2017. 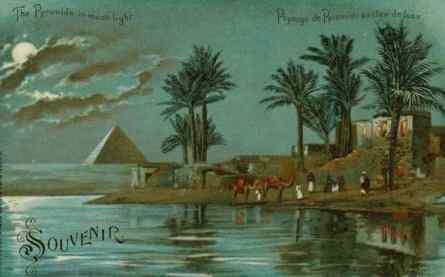 One of the most copied engravings of Egypt. 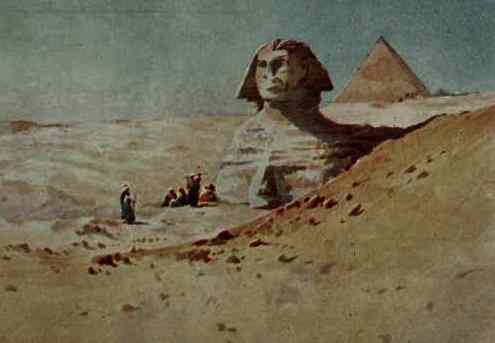 and Geo Colucci's massive Sphinx from the 1924 edition of M. Loti's book.